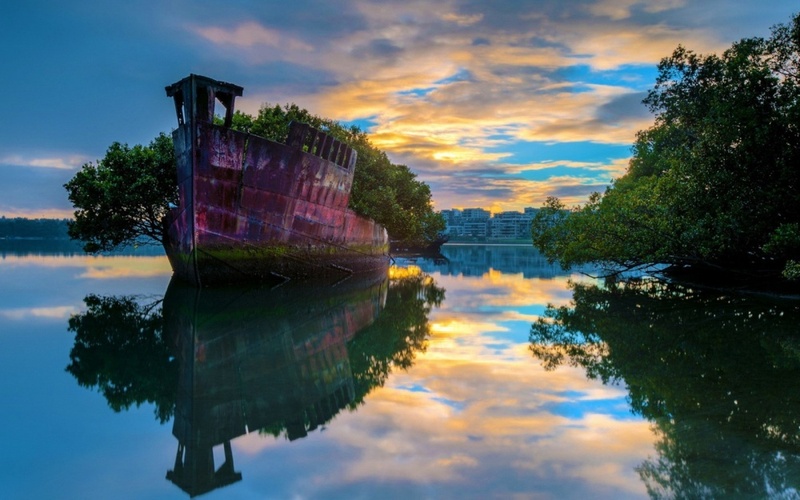 Ship wrecks and their fate. The sea beds of the world are covered with the corpses of ships that once in their glorious working days sailed the oceans to various destinations. Their meager remnants are bound to rest for ever in the gloomy depths. Many of them were battle ships or freighters sunk during WW II. Some legendary vessels like the Lusitania—the elegant passenger ship that was sunk by a German submarine in 1915 is one of the pivotal moments of World War I. The Bismarck and the Titanic, two other icons. were thought to be unsinkable. Some wrecks have stranded on beaches where they remain as tragic maritime monument of the past* ‘Listening to the wind that howls mournfully in the cracks of her busted deck’. Indeed, a ship wreckage has always been a dramatic event that even inspired poets to write down sad lines. However not all sunken ships have become grim solitary tombstones. Some of the more shallow wrecks even enjoy a great popularity. There are two reasons why. Wrecks often attract large schools of fish as well as species like groupers, moray and conger eels. Second, they have built a reputation as photogenic locations ‘par excellence’ with light breaking through openings in the decks and portholes. The expansion of underwater photography made wreck diving evolve from a risky sport for ‘dare devils’ to an opportunity for shooting exceptional and artistic images. But even then one should be aware of its hazards: loss of orientation and sense of depth, getting stuck in a narrow passage or entangled in lines or nets. Numerous wrecks have attracted the attention of divers or been described in diving magazines. That is why I shall only pick out some of the more famous ships, most of which I was able to visit myself. Mediterranean The Donator (Prosper Schiaffino) is perhaps the most famous shipwreck of the French Mediterranean coast. In November 1945 its bow hit a drifting mine near the island of Porquerolles where it lies at a depth 40 meters. Not so far from the Donator lies the Michel S, a cargo ship sunk in1900 at a depth of 40 meters. The often strong currents, great depth and low visibility make these sites less suitable for the underwater photographer. Of all the wrecks that have sunk in the last two millennia in the Mediterranean those of ancient Rome have always made the strongest appeal to our imagination. The Romans called the Mediterranean ‘Mare Nostrum’, our sea. But many of their wrecks are covered by sand and mud, or have vanished leaving only their cargo held in clay jars known as amphorae. Red Sea. Some Red Sea wrecks enjoy a tremendous popularity. The treacherous reefs are one culprit for their sinking. War activity is the other. Most famous perhaps is the Umbria in the Sudan. This German freighter. built in 1912 and later turned into Italian cargo ship, can be found just off the coast of Port Sudan. At the time it was sunk in 1942 the ship went down with a huge loot of cargo- 360,000 aircraft bombs. The reason why is that the captain did not want his cargo to come in hand of the following British navy. So he decided to sink the boat at Wingate reef where he was forced to anchor. The Umbria has a great marine life and easy to dive because of its shallow and sheltered location. Even more popular became the Thistlegorm, a wreck in northern Egypt. She was sunk on 6 October 1941 North West of Ras Muhammad by German bombers, and discovered by Cousteau about 10 years later. The cargo consists of explosives, Bedford trucks and Norton and BSA motorcycles The wreck is broken in two parts which makes it easy to enter the holds with the vehicles in bow section of the ship. Not so far from the Thistlegorrn, near Hurghada, lies another popular wreck the Ghiannis D, a Greek cargo ship that was built in Japan. After crossing the Suez Canal in April 1983 it headed south but was diverted from its course to the northwest corner of Abu Nuhas reef where it crashed. The stern section is separated from the rest of the ship which gives an easy access to the engine room and several stores and warehouses. Light plays an essential role in this wreck, offering beautiful effects trough the decks and portholes. It is visited by numerous glassfish occupying the bridge, batfish, lionfish hovering over the wreckage. In fact the whole area in the Strait of Gubal around Abu Nuhas, north of Hurghada is a wrecks graveyard with wrecks like the Carrnatic, Chrisoula K. and Kimon M. And, not to forget, the Dunraven west of Ras Muhammed. The Carribean. The Kittiwake in Grand Cayman, has recently become the most famous wreck of the Caribbean and a favorite target of UW photographers. This former submarine rescue vessel was brought to her location for the purpose of forming a new artificial reef She was sunk off at Seven Mile Beach Grand Cayman in January 2011. The vessel was cleared of all hazardous materials and had holes cut from the hull. Many original instruments were left intact, allowing divers to roam through the different chambers. Many smaller wrecks in the Bahamas lie on its shallow banks. Some of them can be easily explored by snorkelers. The wreck of the Sapona for example has been a sailor's navigational landmark for many years, because it sits high out of the water south of Bimini. The Sugar Wreck, off the West End of Grand Bahama Island Is said to have congregations of snappers, grunts, wrasse, gobies, angelfish and parrotfish. Then there is the Hesperus lying on the vast sandy plain of the Grand Bahama Bank, also packed with fish and huge Loggerhead turtles that shelter within its planks and plates at night. Pictures of wrecks Pictures of wrecks at some distance are often taken with available light with a wide angle or even fish eye lens. The stern portion of the Giannis D has often been used for this purpose. Sometimes in color using a magic filter. But big scenes of a wreck also come out nicely when transformed to black and white. Shooting inside the wreck requires subtle mixed lighting. The strobes are needed to lighten up colorful foreground objects like a school of fish or a sea fan, while capturing some blue water on the background for a nice perspective. Sometimes a ‘snoot’ can help in lighting a smaller object, without affecting the interior of the wreck. In some wrecks like the Thistlegorm or the Kittiwake off camera strobes have become a popular gimmick. Here the secondary strobe is hidden in or behind the vehicle and triggered by a slave by the primary strobe on the housing.